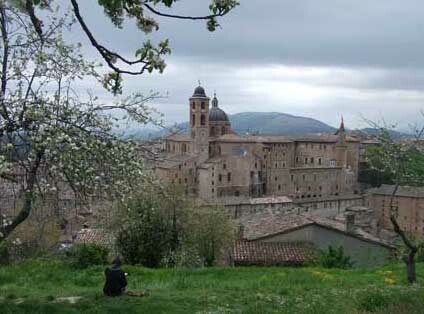 For tourists planning an in-depth cultural tour of Italy, Urbino is a must. The hill-town is off the tourist trail in the region of Le Marche and is tricky to fit into itineraries, but it holds an important place in the artistic history of Italy. Duke Federico da Montefeltro (1422-1482), military leader, ruler and humanist patron of the arts, built a palace and maintained a famed court here; one of the most important in Renaissance Italy. The principal tourist sight today is his palace, which houses the National Gallery of Le Marche (Galleria Nazionale delle Marche). Urbino has UNESCO World Heritage status for representing 'a pinnacle of Renaissance art and architecture, harmoniously adapted to its physical site and to its medieval precursor in an exceptional manner'. Urbino is still proud of its cultured standing and is a university town. Urbino is quite a small town, confined to a couple of hilltops enclosed within defensive walls, and it's not hard to get your bearings. From the gateway (Porta Valbona) by the bus stops in Borgo Mercatale, you can visit a tourist information office on your right, or just walk up Via Mazzini to Piazza della Repubblica. This is a crossroads at the centre of Urbino; other roads slope up to the town's various 'summits'. Taking Via Vittorio Veneto, on your right, will lead you to another tourist information office - where you can obtain maps and timetables - and the Ducal Palace. In the other direction Via Raffaello leads past Raphael's house and up to a great viewpoint (more below). The Ducal Palace - Palazzo Ducale - is Urbino's principal tourist attraction. A combined ticket is available for this and Urbino's other museums; it's worth buying if you plan to tour the town thoroughly. Over-65s and under-18s, as so often in Italy, can visit the Ducal Palace free of charge.The current main entrance to the palace is surprisingly unassuming; inside the courtyard, however, the visitor begins to taste the grandeur of Federico's commission. 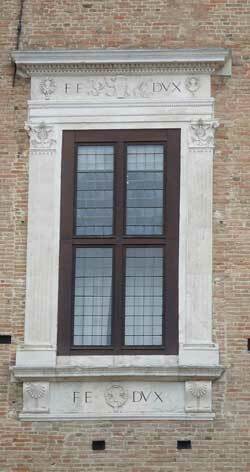 His name appears everywhere: 'Federicus Urbini Dux' or simply 'FE DUX', on walls, fireplaces and window frames. The rooms of the palace are mostly bare, although one does retain scraps of courtly frescoes. The highly-decorative doorways and fireplaces are an indication of the splendour which the ducal court would have enjoyed. Federico's 'alcove' is one of the most interesting exhibits - a kind of ornate painted wood room within a room, which was found in pieces in the nineteenth century in underground storage. The best-preserved room of the palace is the duke's private study, a small secret space within his apartment, which is beautifully panelled in inlaid wood. Art in the gallery includes the Flagellation by Piero della Francesca, a view of an empty Renaissance 'Ideal City' by Luciano Laurana, Raphael's portrait of The Mute and works by Guercino, Guido Reni and Orazio Gentileschi. Don't miss the painting by Pedro Berruguete of the ugly Federico, reading, with his young son. The most famous painting of the duke, by Piero della Francesca, is now in the Uffizi Gallery in Florence. The artist Raffaello Sanzio - better known to English speakers as Raphael - was born in Urbino, and his birthplace is now a little museum, the Casa Natale di Raffaello. Raphael's father was court painter to Federico and obviously a man of some standing. The family home is a substantial building with an attractive interior. It was purchased in the nineteenth century with the financial support of a 'nobleman from London' and has been kept fairly bare, with some minor artworks and copies of paintings by Raphael on the walls. It's a good chance to see a historic town house, probably little changed from the time when Raphael was growing up. Note that the museum is closed for several hours in the middle of the day. Down a lane opposite the Ducal Palace, behind the church of San Domenico, is a fifteenth-century fresco of the Madonna, which can be seen through a glass wall. There are more exciting frescoes, though, in the Oratorio di San Giovanni, on Via Barocci. When I visited I was the only tourist there, and it was a novel opportunity to stand in an empty church admiring an entire fresco cycle in peaceful solitude. The paintings date to 1416 and are by the brothers Jacopo and Lorenzo Salimbeni. The frescoes are fresh and charming, illustrating the crucifixion and scenes from the life of John the Baptist, including his baptising of the faithful, his death, and mourners carrying his headless corpse. 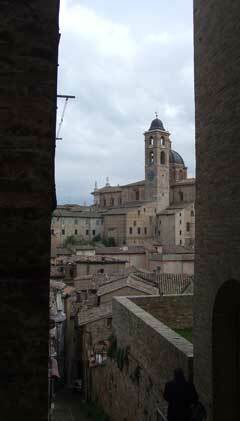 Some of the finest views over Urbino are from the top of the slope opposite the Palazzo Ducale. A small public park here - the Parco della Resistenza - is a lovely place to sit with a picnic or a snack from the small cafe and admire the views over Urbino's rooftops. The park is alongside the Fortezza Albornorz, Urbino's defensive fortress, and there are entrances from Viale Buozzi, outside the walls, and from Via dei Maceri, which branches off at the top of the steep Via Raffaello. Other sights of interest in Urbino include the Duomo, in a Neo-Classical style, and the Grotte underneath: surprisingly large chapels carved out of the rock. The ticket to the underground chapels includes admission to the Museo Diocesano, a little religous museum. There is also a town museum (Museo della Città), and a botanic garden on Via Bramante. You can visit Urbino in a day, but I would advise you to check the opening hours of the town's museums as soon as you arrive, or in advance on the town's website (see links panel on the right). Although the Ducal Palace has long hours (apart from Monday afternoons), other sights tend to close at lunchtime for as long as three hours. Times vary, so I haven't listed the details here. I visited Urbino in the spring, and found it plagued by large and noisy Italian schoolparties. Don't wait in queues behind large parties at the Ducal Palace - during my visit the staff were halting groups until others had moved on, but individual visitors were permitted to overtake and wander at will. There are lots of Italian 'fast food' type outlets in Urbino where you can pick up a pizza slice or a heated piadina (flat bread sandwich). If you prefer to rest and take a break from sightseeing, there are several restaurants in town which are all signposted from the main streets. I ate well at Il Portico on Via Mazzini which combines the functions of bookshop, bar and simple restaurant. Urbino is most easily reached from the Adriatic coast. It is not on the railway network, and it is connected to Italy's public transport system by bus, linking the town to Pesaro on the coast. Urbino buses leave from outside Pesaro railway station. Times are irregular, but there are approximately two buses an hour. Some are slow local services and others, fractionally more expensive, provide a 45-minute fast connection - the latter are indicated by the description corsa rapida. Bus tickets can be bought from little bars and kiosks between the railway station and the bus stops (to the right as you leave the station). They have big signs advertising the tickets. Timetables are displayed by the main bus station ticket office (biglietteria) further ahead, and also on the Adriabus website (see our links panel). Decide which service you will catch and buy the correct ticket. In Urbino tickets can be bought at a tobacconist's in Borgo Mercatale opposite the bus stops. You may also be able to buy tickets on the bus, but will need the correct change. Borgo Mercatale, where buses and coaches stop, is just outside the town walls. Car parks for visitors are dotted around the walls; you cannot drive into the centre of Urbino without a permit (check with your hotel, if it is located in the town centre). In the summer holiday season there are additional tourist bus services to Urbino; from Rimini, for example. If you are staying in a nearby resort it is worth asking at your local tourist information office. Travellers who choose to stay overnight in Urbino will get a chance to enjoy a very different atmosphere in the town in the evenings once the day-trippers have left. Accommodation includes the popular and central three-star Albergo Italia and the castle-view B&B Torricini Skyline. If you are driving, there are some tempting rural options in the countryside around the town, such as Urbino Resort, which offers apartments and rooms on an organic farm, with a swimming pool and restaurant. 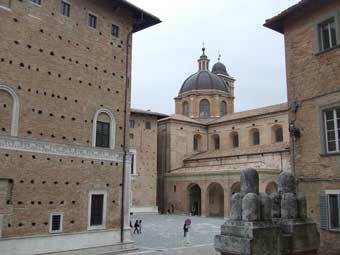 Urbino can also be visited as a day trip from the Adriatic beach resorts where there is a huge choice of hotels. Pesaro is an easy starting point, and Urbino can also be visited as a straightforward day trip from the other towns linked to Pesaro by train: Rimini, for example, is 30 minutes' train ride away.